You can select up to 3 travelers in total. 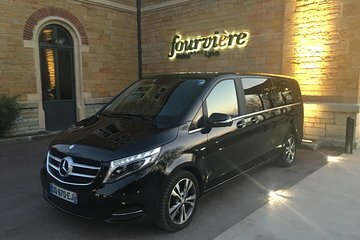 Enjoy a hassle-free arrival in Lyon with this private transfer service. Meet your driver at Lyon-Saint Exupery Airport, and relax on the journey to your hotel or private residence in central Lyon. This private transfer service is available 24 hours a day, seven days a week. Stress-free way to arrive in Lyon! Great service. Our first trip into this area and the driver was very pleasant and provided a bit of an impromptu tour as we drove into the town. Our flight was a little late but this presented no problem to them. Also, we had a lot of luggage and, again, this did not present any issues. We arrived in Lyon and the chauffeur was waiting for us. We felt very special! He was very professional and knowledgeable about the city. We would highly recommend this service. Thank you. Merci. We were greeted at airport by professional driver. There was some discussion between the two drivers present which car we would use, they agreed larger, since we had a total of 2 large roller luggage, 2 small roller luggage and two attache style bags. We then had to walk to parking lot, wheeling our luggage to car. The location could have been closer, perhaps not available at MRS airport small issue. I'm not certain how much English/American our driver spoke beyond basics, but we arrived at our destination without issue. I would recommend this company. Great way to transfer to hotel. After travelling overnight from Canada it was nice to find a driver just waiting at the baggage claim exit! No stress, eassyyyyyyy transfer to our hotel! Pickup was on time and easily identifiable. Vehicle was clean. Transfer to hotel was smooth and efficient. Excellent service. The driver was waiting for us as we left the airport baggage claim area. Excellent automobile as well. Perfect! We had a black Mercedes Benz AMG for our transfers clean with nice leather interiors. The driver was really courteous and on time. Private transfer worked as expected; driver met me at arrivals, car was clean; driver was courteous, transfer to hotel was smoothly done. I would use this service again.